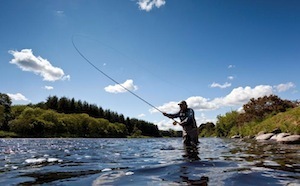 Simon Torkington managing director of Liquid Qatar shares his journey from the Persian Gulf state of Qatar to the river Tweed to cast a line for salmon. It’s 2am the night before my first fishing trip of the year and sleep has abandoned me. The anticipation, the mere possibility of my first Tweed springer, has overwhelmed the need for a long, deep slumber. A couple of hours of dozing fitfully are ended when the sonorous wail from hundreds of mosques floats above the city. The Muezzin are calling the Muslim people of Qatar to the dawn prayer. Their religious incantation precedes the electronic chorus from my iPhone alarm by five minutes. It’s a far more melodic way to begin the 3,500 mile journey from Doha to the banks of the River Tweed. As I board my early morning flight the temperature is already nudging 35c. Seven hours later in Manchester it’s 20c cooler. I can feel the relative chill in my expat bones but there’s little to hint at the vicious blow the weather will land later in the week. At my UK operations centre, (aka my Mother’s house) I round up all of my salmon fishing gear and pack it into the 4×4 I keep for adventures back home. It feels almost indecent to leave so soon after arriving. They say blood is thicker than water but the draw of the Tweed is stronger than the urge to reconnect with family. I’ll see them at the end of the week anyway so I am on the road within a couple of hours of stepping off the plane. Spring has come late to the UK this year. As the drive north passes there are fewer leaves on trees that should be in full foliage this late into May. After three hours a blue “Welcome to Scotland” sign flashes by as I cross the border. A hundred metres further on, an electronic sign reads “warning, heavy rain and flooding forecast.” My heart sinks. My last trip to the Tweed in August 2012 was a washout. Surely it couldn’t happen again. First stop, the Dryburgh North beat to visit ghillie George Inglis to discuss a filming assignment. As I walk down to the Bridge Pool the beat is deserted. Rising water with a lot of colour had put off the rods in the morning but it looked very fishable by 3pm. After speaking briefly to George, I am torn between the option of setting up my rods or my video camera. I choose the latter and get some lovely scenic shots and record the most dramatic fly hatch I have ever seen. Along the length of the Tweed millions of sedges are popping to the surface before taking off and drifting upstream on the breeze. The next two days are a mixture of filming and fishing at Dryburgh. There is plenty of action in a cinematic sense but nothing on the end of my fly line. In fact the Tweed is struggling horribly on the Tuesday and Wednesday. On the Tuesday a sea trout from the Bridge Pool for Jim McLaughlin was one of just a few fish for the day on the whole river. I miss the chance to film its capture as it is landed when I am in the Borders Gunroom buying a new reel and line to go with a new rod. That Tuesday did however produce a magical moment. I was alone on the beat at around 8pm, wading thigh deep and fishing down the Tod Holes pool. The breeze was heavy with the scent of wild garlic and once again millions of sedge flies were on the wing. Suddenly a stag appeared on the far bank, picking his way through the trees and pausing now and then to bellow. At that moment I would have given almost anything for a salmon to pluck at my Junction Shrimp and slowly draw out the loop of line trapped between cork and my forefinger. Sadly it wasn’t to be. On Thursday morning I am again wakened by a loud wailing sound. This time it’s caused by a gale assaulting the walls of the Tillmouth Park Country House Hotel. As I sit down to breakfast with the other members of my fishing party the beech trees in the hotel garden are swaying wildly. It’s a bad sign. Matthew Webb is in Scotland for his first try at salmon fishing. His first ever Spey cast will be made into the teeth of a 40mph upstream wind. I try to offer words of encouragement along with those of Marc Sabido, my long-term fishing partner, but the look on our faces gives away the concerns we have about the day ahead. We drop Matthew off for his casting lesson at Ladykirk then head to Tillmouth to start our three days of fishing. The word “maelstrom” doesn’t quite do justice to the conditions. The wind is screaming directly upstream, the temperature gauge in the car fails to crawl above a miserable 8c and as we set up the rods the first of many hail showers comes crashing down. This is not the sort of Spring fishing I had in mind when I left the sunshine behind in Qatar a few days earlier. With Stuart the ghillie doing his best to keep the boat in position I nervously get away my first double Spey off the right shoulder. With every cast the wind threatens to whip the brass tube fly into me but somehow it stays out of the danger zone and after a few “feelers” I am casting a reasonable line given the conditions. With the weather like this it’s hard going and with very few fish showing it is easy to begin to believe we are casting at shadows. The one salmon I do see that day is lying in a back eddy right up by the bank. It’s a fish of around 10 pounds but its head and body are covered in large patches of white fungus. The cold water has allowed fungal disease to take hold on Tweed this Spring. Over the next few days I spotted a number of dead fish that were probably killed by this disease. We had hoped for a let up from the weather on Friday morning but it never came. If anything the wind was even stronger. I am on beat four which is normally one of Tillmouth’s best holding pools. But as I wade into the stream white streaks of foam are whipping off the top of waves formed by the motion of the wind roaring against the flow of the river. Davy the ghillie has convinced me to abandon my traditional Spey line in favour of the Rio AFS shooting head system. I have never really got on with these lines but this was the day I was finally convinced. Using it enabled me to get a fly to where the fish would normally lie. It very possibly saved me from whacking a treble into the back of my head too, so a good decision all round. When 5pm came the wind was finally beginning to subside. We dropped Matthew off at the station in Berwick, grabbed some fish and chips and ate them back in the hut with a roaring fire and a cold beer. By the time the meal was finished the clouds had melted away and we fished on well into the evening. It was still cold but after battling a gale for two days it was a relief to watch a loop of line unfold over the water and land softly somewhere close to the intended target. We were hoping the odd sea trout we had seen moving might be tempted as the light faded, but we headed back to the hotel with the slate still blank. On Saturday morning Spring as I remembered it finally arrived. The extra layers of clothing were left in the car as I headed down to beat five with Kyle the ghillie. This has to be one of the most picturesque beats on the whole of the river. I fished down two pools of glorious fly water on either side of a gravel island. I as moved down the pools two peregrine falcons swooped overhead with their keen eyes on some newly hatched oystercatcher chicks in a nest on the island. The adult oystercatchers flew shrieking towards the razor sharp beaks and talons of the birds of prey, trying to drive them away and protect their young. The dogfight went on for most of the day and I’m glad to say the chicks were still in the nest when I left the beat. I fished with more optimism that day as a few fish were seen moving in the pools. Over lunch I heard the first fish of the week had been landed on a part of the beat further upstream. A 10lb salmon had finally come to the net. As the afternoon wore on, optimism took on an air of desperation as another long trip to the Tweed rushed toward its conclusion. Every time my Stoat’s Tail plopped into the pool I mentally begged for a fish to take. A final flurry with the spinner over a hot spot where a fish kept showing failed to bring a dramatic end to a difficult week’s fishing. So I left the river with my senses enlivened by the displays put on by the flora and fauna, but nothing to show for the thousands of windblown Spey casts. I’ll be back on Tweed in August for another try. They tell me that’s summer in Scotland. We’ll see.